Looking good is a goal for most people in America. Because we live in a world where exterior appearances can make a difference in social life, employment and career opportunities, most people are ever more conscious of ways to improve themselves. While there are many facets to looking and feeling healthier and younger, not all the procedures are worth the risk. In fact, some of the procedures can be a significant health risk, and can alter the appearance of a person in a negative way. That is why today, more than ever, people are looking into the advanced techniques that are available to them to aid them in reducing skin discoloration, brown spots, scarring and age lines. Though aging and brown spots seem to be more problematic for those who age, acne scarring can be quite troublesome for the young. While evidence of aging and acne is a part of life, it does not have to be a significant deterrent to appearance. There are a host of procedures that are known to treat the signs of aging, skin discoloration and scarring that can occur on a person’s face. Some of these include surgical and non-surgical procedures, while there are others that are purely cosmetic. However, there is an area of treatment for these conditions that works very well. This procedure is not surgical, nor is it a simple cosmetic fix. This falls in the category of facial chemical peels. 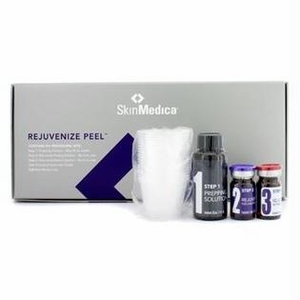 There are many different products on the market, but one of the best is Skinmedica Rejuvenize peel. Chemical peels consist of chemicals and natural aids that take off the top layers of skin to reveal healthier looking skin underneath. Some chemical peels can be a bit overwhelming and painful for dermatology patients causing them a few days or a week of down time. However, the good news is, there are some chemical peels that can be quite mild. The Skinmedica Rejuvenize Peel has helped many people to reclaim a clear complexion with less signs of aging and very little down time. It is not only mild, but also effective. While some chemical peels can be particularly harsh, and can leave a patient with some soreness and red spots, this is not the case with this product. In addition, some peels show little initial change in skin discoloration, even after several treatments. With the Skinmedica Rejuvenize Peel, dermatology patients can see immediate results after just one peel. However, after 3 to 6 peels, the difference is quite noticeable and can help those who suffer from complexion problems and aging signs to regain a youthful clear complexion gradually without painful surgeries or toxic chemicals. This can be especially helpful for those who suffer from brown aging spots, blemishes and scarring. As with any procedure, patients are advised to consult with their primary medical doctor to make sure the procedure is safe for them under their current health conditions. While this procedure has helped many people regain their youthful appearance and reduce the signs of aging, skin discoloration and scars that can occur on a person’s face, it’s not right for everyone. But it is certainly worth your while to find out if Skinmedica Rejuvenize Peel is an option. The kit includes 1 Prep solution (enough for 6 peels), 6 sealed bottles of Rejuvenize Peel and 6 bottles of retinoic acid .3%. For a closer look at Skinmedica Rejuvenize Peel, and the complete line of Skinmedica products, click here. Skincare Solutions Store has a amazing selection of quality skincare products that will help your skin stay young and healthy looking.